The Chris Canas Band can be seen blazing a trail in the Metro Detroit area and beyond. In 2007 the Chris Canas Band won their first Blues Competition when they competed in the West Michigan Blues Society’s challenge. 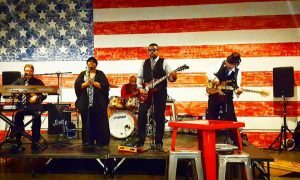 They also won the Kalamazoo Valley Blues Association challenge in 2010, the Detroit Blues Society challenge in 2012 as well as 2014. Chris ” The Soldier For The Blues” Canas, has put together a who’s who of veteran musicians over the years and has learned many many lessons the long hard way to help keep the blues alive and moving forward for all music lovers. The Chris Canas Band has a well blended set of classic covers and clever, roller coaster like originals that keep the audience captivated and coming back for more. With their diverse mix of Blues, Funk, and Soul they are always well equipped to bring the party wherever they go. With heart-wrenching vocals, pulse pounding rhythms, and an electric energy that can be felt in the air. Don’t miss an opportunity to see the CCB “LIVE” and in the flesh. Do your Soul a favor and feed it some hot Bluesberry Pie with a side order of fresh cut Funk and a tall glass of Soul! The Chris Canas Band is available as an Acoustic Solo-Duo, Three Piece, Four Piece, or Five Piece act. This band is driven to pump new life into “The Blues” as well as embracing the rich traditional roots of the past. Get to know a little more about the Chris Canas Band!